The deputy Senate President, Dr Ike Ekweremadu at the weekend said that no amount of intimidation and blackmail by the All Progressive Congress, APC, will not stop the Peoples Democratic Party, PDP, from taking over power. 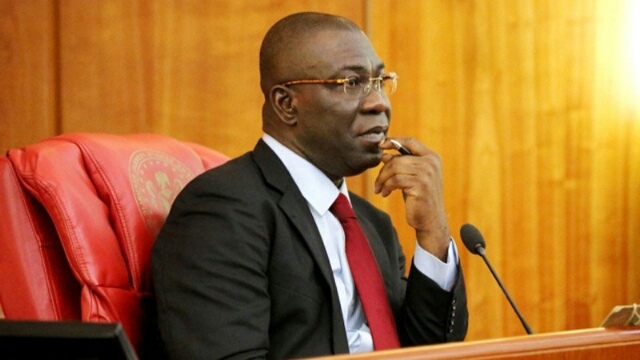 Ekweremadu made this known during the PDP, south east zonal stakeholders’ meeting which took place at the government house Abakaliki, capital of Ebonyi State. He decried that the ruling party, APC, was using intimidation and blackmail to witch-hunt opposition parties to gain power in 2019, which according to him, cannot work again in Nigeria. He said: “We are a party with history and a party with character. We demonstrated this for over sixteen years that we ruled this country. We are proud of our state heritage and we will never lower the standard. We are governing and by next year we will get back to power. “I thank the south east PDP for the steadfastness you have shown over few years of APC governance in Nigeria. “I appeal that we continue in the part of honour. The APC government believed that it can capture power by intimidation and blackmail and it has never happened and it will never happen. The deputy Senate President also exonerated himself from the accusations by the Federal Government that he acquired illegal properties within and outside Nigeria. “As my people, I will tell you the truth. I committed no offence, even though the matter is already in court. I don’t intend to go into details but let me just add that it is only the politics of 2019. “I want to state clearly that what we are witnessing is unfortunate and embarrassment to us as a country, a situation where a government in power has tried to use established anti corruption agencies to harass and intimidate opposition. “They decided on their own to use soft tackles which will never be accepted by anybody not within, not outside. What we have found out over two weeks is that bunch of APC lawyers assembled themselves and called themselves panel for the recovery of government properties led by a man that called himself Okoi Obla. “As a lawyer, I am sure that common sense will tell you that you can never be a judge in your own case. There is no way cats will assemble themselves and say they are going to investigate rats because the rat will never have any justice. “Obla and his co travellers think we are all very stupid, There is no way Nigeria or international government will watch a panel to track PDP, it will never happen. “So, I want to appeal that we continue to pray for this country because the days ahead are very worrisome but by the grace of God, we will over come,” he enthused. Responding, the chairman South East Governor’s Forum, Chief David Umahi applauded all governors in the PDP controlled states especially in South east for their good works done. “All PDP governors are performing and what they are doing are glaring in the south east and in the eleven states they are controlling. “I suggested to the national chairman (Uche Secondus) that we should do a documentary of the achievements of PDP right from when we started under Obasanjo, that of Yar` adua, Jonathan and look at the current states controlled by the PDP now,” he said. He noted that the said documentary will show Nigerians the difference of what PDP had achieved and was still achieving and what it intended to achieve more. In attendance were Enugu state governor, Rt. Hon. Ifeanyi Ugwuanyi, Deputy Senate President, Dr Ike Ekweremadu, among other prominent stakeholders from the south east zone.